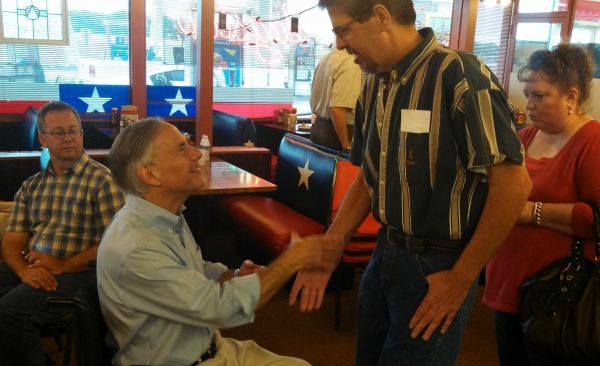 BOERNE, Texas -- Surrounded by diners munching on breakfast tacos and "the best fried chicken you will ever eat," Texas Attorney General Greg Abbott rolled into the Flagstop Café off I-10 West on Wednesday morning and maneuvered his wheelchair around the room to shake hands with supporters. The odds-on favorite to win next year's election to succeed Gov. Rick Perry, Abbott has been eager to hit the campaign trail in earnest this summer, conscious that many Texans still don’t know much about him. Speaking into his microphone with the even-toned clarity of someone who has told the same story many times, Abbott recounted for the few dozen people present the freak accident that partially paralyzed him in 1984. Abbott, who announced his candidacy for governor last month, spoke of the work that he and his doctors undertook in “piecing my life back together, literally,” noting the two steel rods flanking his spine that will remain there for the rest of his life. The crowd loved it, responding almost as positively as they did to the rest of Abbott’s stump speech, which doled out heaping servings of red meat to accompany the breakfast tacos and fried chicken. In rapid succession, he touted his support for strict voter ID laws, his efforts to defend the phrase “one nation, under God” in the Pledge of Allegiance, and his concern that the U.S. adaptation of the United Nations Arms Trade Treaty (which seeks to regulate the transfer of weapons between nations) would infringe upon Second Amendment rights domestically. The line may not be the most original piece of political prose that the former Texas Supreme Court justice has ever dreamed up. But for the man who rose to national attention in 2005 by leading a successful fight in the U.S. Supreme Court to display the Ten Commandments outside the state capitol, it struck exactly the tone that he was after. In the early stages of his campaign, Abbott has sought at every turn to tout his conservative bona fides on hot-button social and cultural issues, despite the lack of a challenge from a viable Republican primary opponent and efforts by Democrats to paint him as an extremist. In Texas, where a Democrat has not been elected to any statewide office since 1994, this tactic remains a safe bet, especially when considering Abbott’s likely general election opponent: state Sen. Wendy Davis, who is expected to announce shortly after Labor Day her intention to enter the race. Still, Abbott isn’t taking victory for granted. From its beginnings, the operatives behind Battleground Texas have emphasized the long-term nature of their attempt to identify and register enough left-leaning voters to turn Texas into a potential deal-sealer for future Democratic presidential candidates. But the impending clash between Davis -- a recently minted progressive superstar -- and Abbott -- an old-school conservative stalwart -- in the state’s first open gubernatorial race since 1990 will pose the first high-profile challenge for the group, whether it’s prepared to face such a test so soon or not. Jeremy Bird, who was the national field director for President Obama’s 2012 re-election campaign before assuming his current role at the helm of the super PAC, said in an interview he was “flattered” that his group is being mentioned in Abbott’s stump speeches. And Bird left no doubt about Battleground Texas’ plan to play a key role next year in promoting Davis’ expected candidacy. After earning national attention in June for her 11-hour filibuster of a bill implementing new abortion restrictions -- legislation that Perry ultimately signed into law -- the state senator from Fort Worth would enter the race with much fanfare on the left. But she will be a heavy underdog. Still, there is a strong political case for Davis giving it a shot. After drawing an abbreviated two-year term in the constitutionally mandated post-redistricting lottery, Davis has been staring at the prospect of a challenging re-election fight for her Senate seat next year after barely defeating her Republican opponent in 2012. And even if she does lose to Abbott in the gubernatorial race, Davis will be lauded by fellow Democrats for stepping forward to run. What’s more, a future in national-level politics may beckon. But even the most optimistic of Texas Democrats would have to concede that Davis’ hopes of actually defeating Abbott are long. And last year, Mitt Romney bested Perry’s margins in the Tea Party wave of two years prior by walloping President Obama in the Lone Star State, 57 percent to 41 percent. Despite their grand designs, Democratic groups have a long way to go before making the state truly competitive. Battleground Texas reported raising a relatively robust $1.1 million in the first half of 2013, and Bird was eager to tout a median contribution of around $25 from a pool of more than 3,500 donors, the majority of whom reside in-state.